I would never have considered doing Viking Knit with leather until Stephanie Eddy, the co-inventor of the Lazee Daizee showed how it can be done! 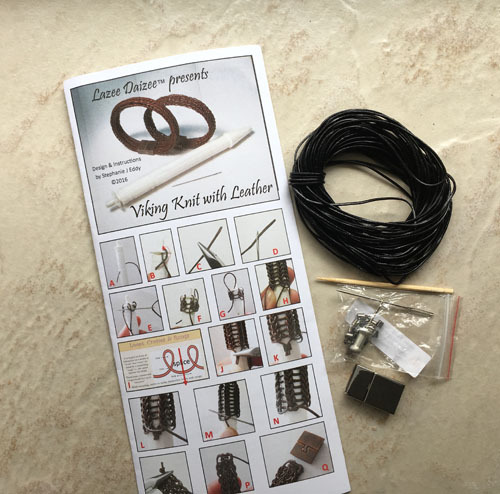 She also sent me a 1 mm leather cord kit for me to try it out for myself. I had fun doing this and came up with two different designs. In order to keep the posts to a manageable length, I have divided the tutorial into two. This tutorial covers a basic leather viking knit bracelet tutorial with a few technique modifications and tips of my own. 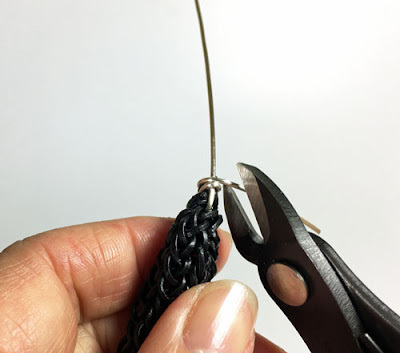 I used the large 1/2 inch Lazee Daizee Viking Knit tool for this black leather cord tutorial (the smaller tool will be used for the second tutorial later this week). 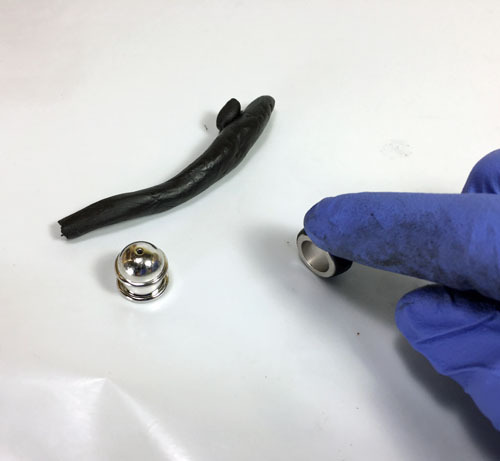 You could also use the wooden dowel method but I personally prefer the Lazee Daizee tools because you do not have to make and try and attach a wire clover. The less hassle the better! 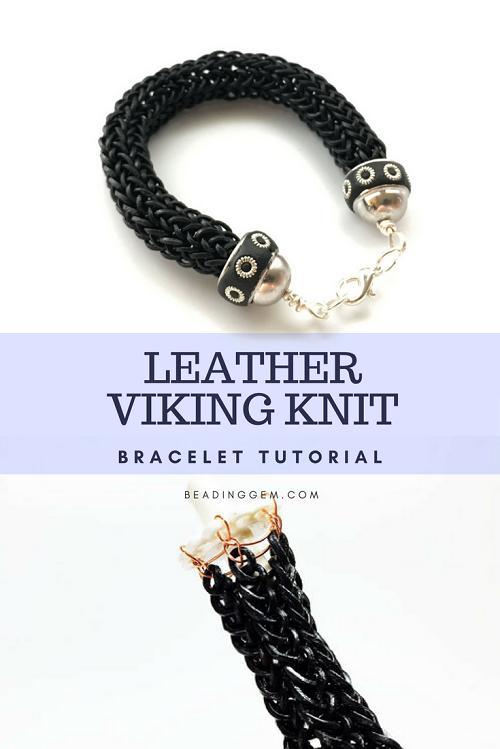 But first here is Stephanie's own tutorial which outlines how she makes her leather Viking Knit pieces. She goes over the major differences working with leather as opposed to wire. You do not need a draw plate although the leather work does stretch a little. 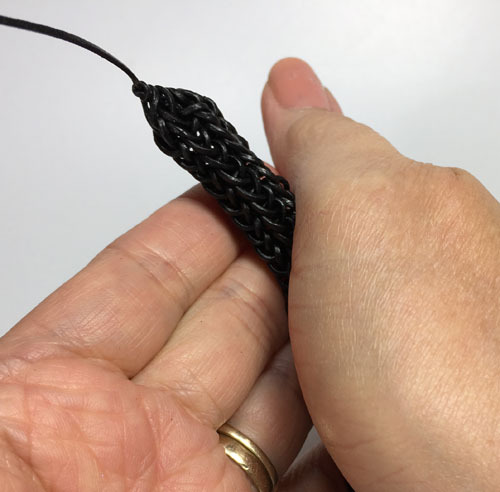 She demonstrates the use of large crimp tubes (like these 3x3 mm ones) to join leather lengths. She also told me in an email, "Some of my students have had good luck just tying the leather splices together with no crimps." But since we are not working with wire, I decided to experiment and see if I could eliminate the need for crimps and splicing altogether. This requires working with a long length of cord. You cannot do this with wire as it will get bent and will overly work harden too. Well it worked! 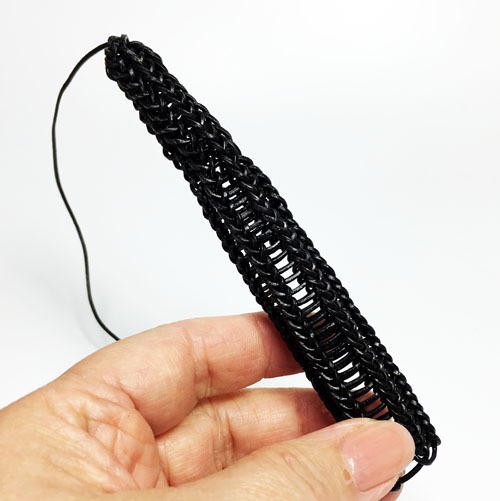 It took a little patience to work the entire length of cord through especially at the beginning but it got easier as the bracelet got longer! I actually began with some scrap 26 G wire so I wouldn't have to cut the leather loops at the top when I finished. I also used every other hole of the large Lazee Daizee tool. 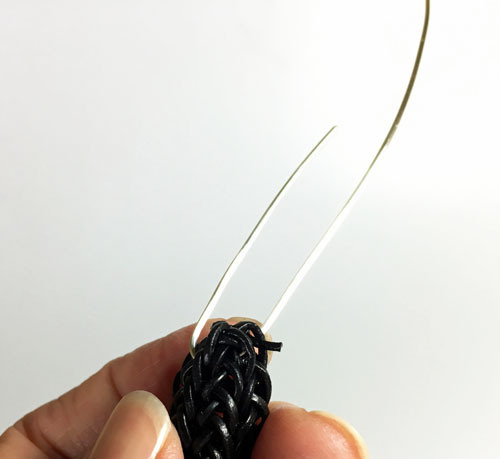 This results in a looser weave compared to every loop on the smaller 1/4 inch tool as shown in the brown leather piece below. So it is down to personal preference. 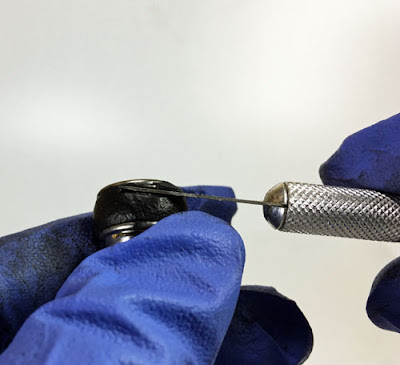 One tip, do not trap the leather end at the beginning into the work - we usually do this for wire. Once the scrap wire is cut and the work removed from the tool, use the leather end to go through all the leather loops. Tighten and make a knot or two. 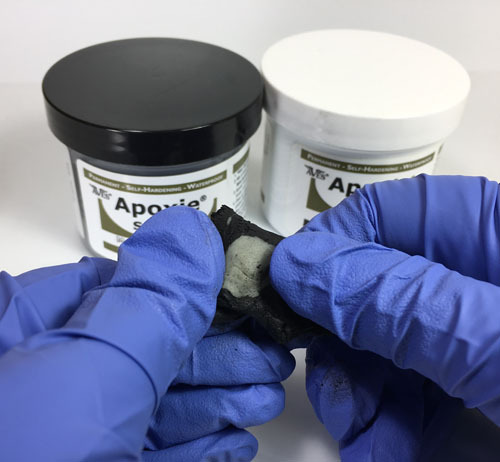 Then add a drop of Super New Glue (this is not the same as the regular Super Glue) or some other glue like E6000 to seal. As the leather stretches, the work looks uneven. So, roll it between your hands till it is a uniform length. It will also get a little longer. I created a six inch length of leather Viking Knit as measured while on the tool but was longer than that with the rolling. 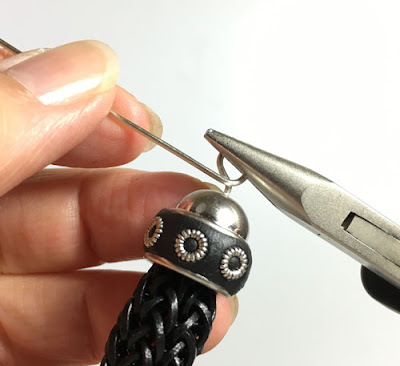 If this is still too short for you, just add some pretty beads after the bead caps! I decided not to use the flat glue-in clasp which came with the kit. I've mentioned this before about decorating channel bead caps with resin clay. So this was the ideal project to show how I do it. I received these beauties from Tierracast for review a while ago. These particular ones below have holes which will require some wire work. 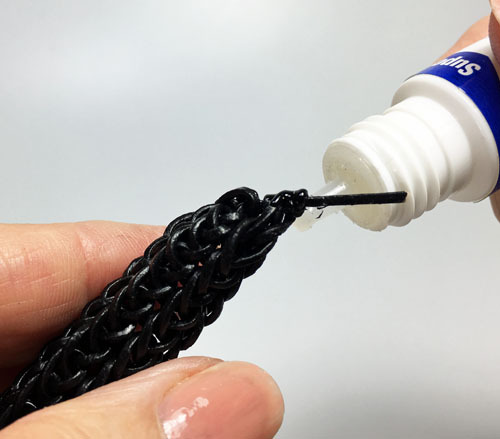 If you cannot get these, they also make the glue-in variety with or without the channels. If you use these, Super New Glue works very well and is less messy than E6000 for this application. 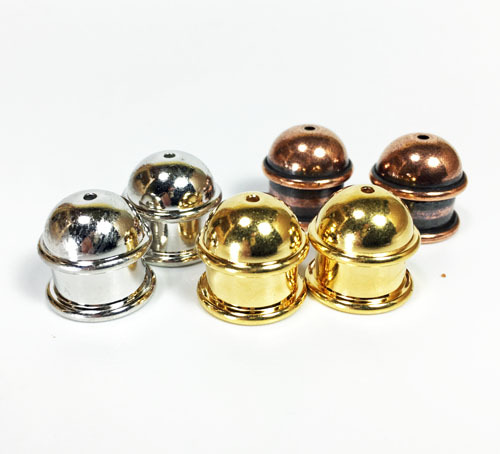 Just add a few drops inside the caps and then insert the cord. 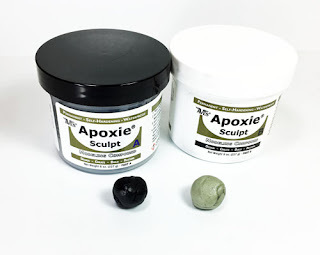 I used black Apoxie Sculpt resin clay. I bought a larger quantity but you can also buy smaller amounts if you aren't going to use buckets of it. I used gloves to mix 2 approximately equal sized balls taken from Part A and Part B. The gloves is because resin clay is also an adhesive clay and is sticky. Mix until the color is well blended i.e. no streaks. Remember that resin clay will cure to a hard consistency in a few hours. I made a small snake and applied a little of it onto the channel portion of the caps. Pat smooth. Some clean up on the edges might be necessary with a sharp tool like an Xacto knife. Then press in whatever you wish - metal rondelles, chain, beads, flatback crystals etc. Let the resin clay harden overnight. As I did not use glue-in cord ends, I had to do a little work work. Cut a short length of 20 G wire - about 5 inches and insert through the top of the leather work. One end of the wire should be shorter. 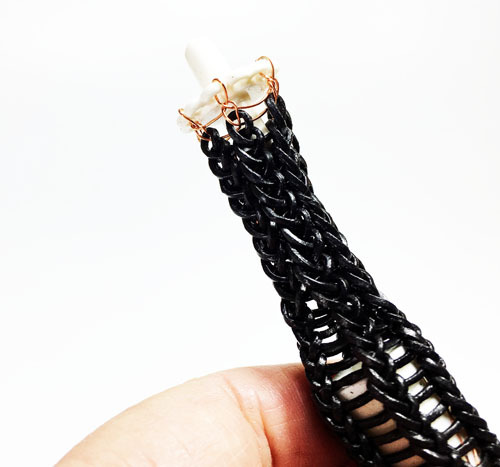 Basically make a wrapped loop using the short wire end. Trim. Feed the end cap through then make a bend just a bit past the cap. 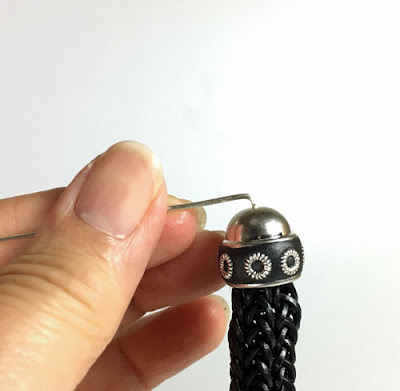 If you want to lengthen your bracelet, add a bead or two before you make that bend. Then finish up with a wrapped loop. You can add the clasp at this point. Or, if you still need a little length as I did, I used additional jump rings. 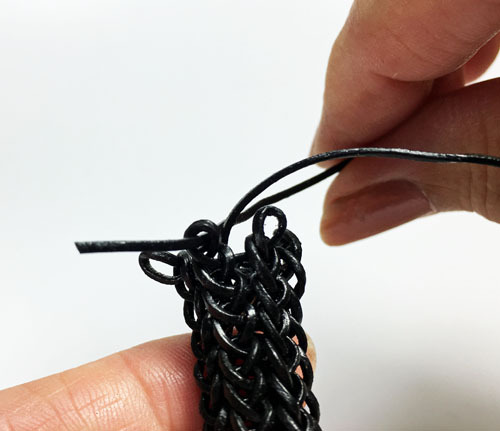 That is just one of an infinite number of possibilities with leather Viking Knit. 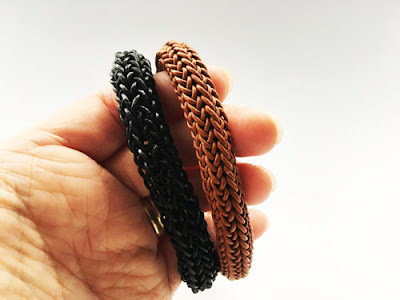 Part 2 for the brown leather bracelet is here. What a great concept. With some different end finishings this would make a great bracelet for men..especially if using the smaller size daisy. It is a very interesting idea and I too have never considered using leather to knit before. 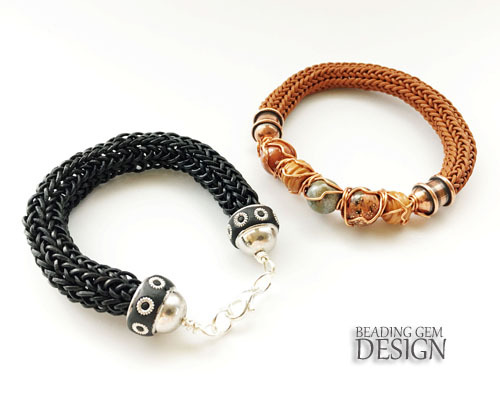 I love the look of the brown bracelet and hope to learn how to do it in the second tutorial.